We’re a nation of pet lovers. And when your dog is part of your family you’ll want to take their needs into consideration if you’re buying a car – especially if they’re regular passengers. There’s no point buying a small hatchback if your Great Dane can’t comfortably travel in the boot. Here, we take you through some of the best cars for dogs and what you need to think about before you buy. Depending on the breed and size of your dog, you might have specific or niche requirements when buying a car. But there are some general things to consider when looking at pet-friendly vehicles. Space: The car must have enough boot or back seat room for your dog to comfortably sit, lie down and turn around. Suspension: Dogs, just like humans, can get travel sick, so choosing a car with good suspension and a steady ride is important. Safety: Your dog must be restrained while travelling in your car (see below) so make sure that you can fit a pet harness or dog grill to the car. Alternatively, make sure that there’s space for a pet crate. Child locks provide additional safety. Boot height: If you plan to load your dog into the boot, make sure it’s not too high off the ground for them. They can easily damage their legs jumping out. Alternatively, make sure you can easily lift your dog in and out of the car. Windows: Electric windows which can be operated from the driver’s seat are essential to provide air for your dog. If your dog is a distraction, you could be stopped by the police and charged with driving without due care and attention, and face a fine of up to £2,500 and 9 penalty points. Your car insurance could also be invalidated if you have an accident caused because you were distracted by an unrestrained pet in your vehicle. A 7-seat MPV and one of Ford’s largest vehicles, the S-Max is a great family option for people who have children and pets. With all 7 seats in human use, there’s still plenty of room (285 litres) for a terrier or 2 to travel in the boot. Folding just the rear 2 seats creates 700 litres of room. If you’re not travelling with children or passengers, you can fold down the 5 rear seats to create a van-like interior with 2,020 litres of space. Room for an entire family of dalmatians! The S-Max also handles well, ensuring a comfy ride for canine and non-canine passengers alike. With a low-loading lip, it’s easy for dogs to jump in and out of and you can easily fit a dog grill. Due to its large size, the Land Rover Discovery is great for big dogs thanks to the ample boot space and air suspension. Choose HSE or HSE Luxury trim and you’ll be able to fold the rear seats down via your touchscreen or smartphone app, making it even easier to load your dog into the car. There’s also plenty of storage in the car for things like travelling water bowls, coats and dog toys. 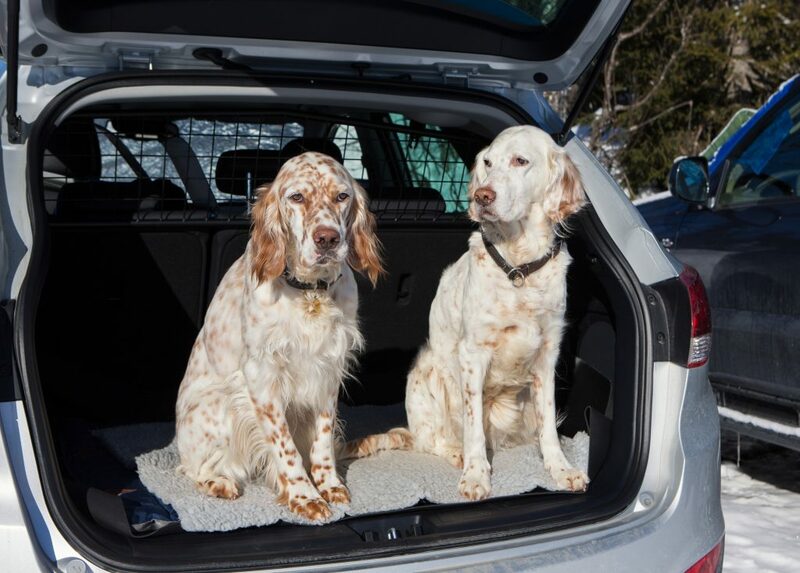 A split tailgate makes it easy for your dog to hop in, and Land Rover offer plenty of accessories – such as partitions and boot liners – to keep your vehicle clean. Its off-roading ability makes taking your hound for a long walk in the countryside simple. The Superb’s boot has a low loading lip and wide opening making it ideal for carrying your dog. With 660 litres of boot space and a specially designed dog safety range, the Skoda Superb is one of the best cars for dogs. For drivers, the quality interior and strong driving performance make it a hit, too. Excellent as a motorway cruiser or country adventurer – with a 4-wheel drive option available – it provides a comfortable and relaxing journey for everyone, whether they’ve got 2 legs or 4. Great for someone looking for an estate car on a budget, the Dacia Logan MCV has a boot to rival vehicles with 3 or 4 times the price tag. The Logan has 573 litres of boot space with all the seats in place, 1,518 litres with the rear seats down. This provides plenty of room for 2 large dogs to comfortably travel. While the trim may be fairly basic, it’s practical, making it easy to clean off any dirt or mud you or your dog brings in. For those after a stylish but pooch-friendly car, the Honda Civic Tourer delivers. The compact estate has a sporty exterior while the interior space is versatile depending on your needs. Complete with a big boot – 1,668 litres with rear seats folded flat – including underfloor storage and a knee height lip, it’s extremely dog-friendly. The S Navi trim gives you Honda’s touchscreen infotainment system with sat-nav while inexpensive dog guards and boot lip protectors are also available, making car maintenance easier. The Volvo V60 is a roomy estate with plenty of space for 1-2 dogs but it’s the rear climate control (ideal for keeping your dog cool in summer and warm in winter) and cutting edge safety track record that sets it apart. With a 5 star Euro NCAP rating, in-built safety technology not only keeps you safe should you crash, but also helps to prevent collisions occurring in the first place. Rear seats fold down electrically creating 1,441 litres of space – that’s more than comparable cars like the BMW 3 Series Touring and Audi A4 Avant. There’s an optional dog barrier and rear tie-downs to make securing your dog for travelling easy. Cheaper than the VW Golf, the Citroën C4 Cactus has similar boot space at 358 litres compared to the Golf’s 380 litres. With an almost SUV-like body style, it has better fuel consumption and running costs than larger and heavier cars on the list. It’s a comfortable ride with a 7-inch display screen and DAB digital radio as standard to keep you and your dog entertained on longer journeys. The top of the range Flair comes with a panoramic sunroof, which some pups will enjoy watching birds out of. Once you’ve decided on your next dog-friendly car AA Cars Finance could help you afford it. Find out if you’re eligible for car finance and calculate how much finance you could get without affecting your credit score today.